My Little Patch of Sunshine: What Should I Read Next? I have a short stack of books to choose from at the moment . . . so I thought I'd ask what you think I should read next! I do have a book review to post later this week, but these are books that I haven't yet delved into. Which ones are you curious about and would like my review? Leave a comment and let me know. I'm curious about Spot of Grace......it sounds like the kind of book that's helpful during this time of year when the regular schedule starts up again, and everything is harried for a little while. Reminders of how little things you do can make a difference might be comforting. Please let me know what you think of Playtime in Phoenix since I'm in the process of updating it. I think I'd choose Playtime in Phoenix. It's always cool to know what kind of stuff there is to do around town. I think we tend to miss out a lot on the "tourist" stuff where ever we live. 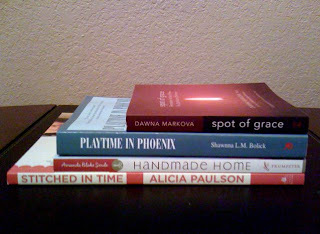 I'm not very crafty and Dawna Markova's book doesn't fall into my usual areas of interest either. BTW, kudos on the schooling solution. You have to make hard choices all the time and I'm not sure I'd be up to the task.